Ingredients: Ammonium nitrate, nitric acid and potassium hydroxide. Get off to a good start! 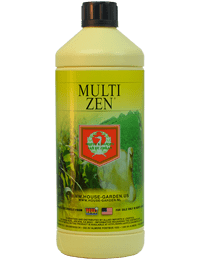 House & Garden Multi Zen (0.2-0-0.7) has been formulated specifically to ensure your crop achieves its maximum potential harvest after harvest. Its unique formulation boosts your plants’ natural immune system and improves the breakdown and delivery of nutrients making them more readily available within the root zone. Easily the most concentrated growth enhancer on the market. Muti Zen’s superior formulation helps to increase flower cites and thicken stalks. All ingredients and additives are made with pharmaceutical and/ or food grade ingredients in small batches to ensure a consistent quality and experience. Mix 1 ml to 1 liter of nutrient solution. Use from the start of week 3 till the end of week 5 of the rearing cycle.